Boston discounts on attractions, coupons, sightseeing passes, and deals can save you big money on almost every part of your vacation - hotels, tours, attractions, Boston Harbor and Charles River cruises, museums, sports, events, theater shows, sightseeing, and even day trips. Discounts on Boston attractions, cruises, shows, hotels, and more start at around 10% and go up to 50% - 90% off. Use enough deals, coupons, and discounts, and you can slash the cost of your Boston vacation. Why pay more when there's no need to? Here's a roundup of how to save BIG in Boston. Goldstar Events offers savings of up to 50% or more on theater, entertainment, sports events, tours, and cruises. Sometimes, they offer free passes. Once you sign up for Goldstar discounts, they'll notify you instantly when free tickets become available. In addition to half price tickets for shows, comedy clubs, and other performing arts, Goldstar frequently offers tickets for Boston Harbor dinner cruises, and special performances by famous visiting performers such as Cirque du Soleil. You'll sometimes even see tickets on offer for Boston's winning pro sports teams: Celtics, Bruins, Red Sox, and New England Revolution as well as college sports. It's no secret that Boston hotel rates rank among the highest in North America, especially from April through early November. Your hotel bill can easily be your biggest travel expense, so finding hotel discounts and deals can save you significant dollars. You've probably read hotel reviews and checked rates on TripAdvisor - but did you know you can also use this popular website to find the great hotel deals? The fastest way to do this is to go straight to their Boston, Massachusetts Deals page. They'll show you all the Boston hotel deals and discounts offered by leading hotels for specific dates - so if you know what your travel dates are, this is the best place to look. To find the cheapest deals, click on Sort by and choose Price (low to high). The second way to find deals on TripAdvisor is to go to their Boston Special Offers page. Special Offers are only available for certain dates - so check this page if your travel dates are flexible. Booking.com offers two types of special deals on Boston hotels: Today Deals for last-minute reservations, and Bargain Deals, which usually offer the lowest prices if you're booking at least 3-4 weeks in advance. To see the Bargain Deals, you need to sign in to the Booking.com website (or register if you haven't already). How much can you save? Today Deals typically offer about 30% - 50% savings, and sometimes even more. You need to move fast to get Today Deals, but the amount you save can be worth it! Bargain Deals usually give you 10%-15% savings, but you get to choose from a wider selection of hotels. Want More Hotel Savings Information? Discount cards give you a great option for saving on admission to museums, attractions, cruises, and sightseeing. Once you buy a discount card, it gives you free admission for a specified number of days. Depending on which card you get and how much you use it, you can save almost 50% or more. Two different types are available in Boston, so choose the one that fits your needs best. 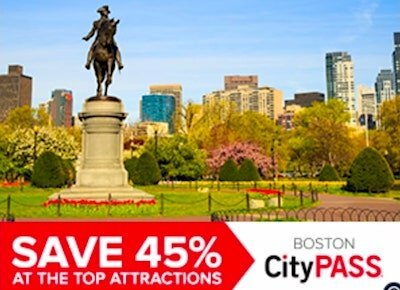 Boston CityPASS gives you entrance to 4 top attractions over a 9-day period while letting you save up to 45% of the regular admission cost - almost half off. You'll save money with Boston CityPASS even if you go to only 3 of the attractions. But you'll probably want to go to all 4 because these truly are top Boston attractions. 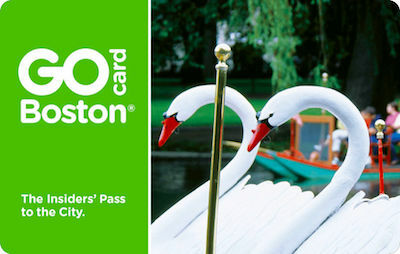 Go Boston Card gives you free admission to 40+ top Boston attractions, tours, museums, day trips, and cruises. You buy the card for a certain number of days (1, 2, 3, 5, or 7), save up to 55% and use the card for as many attractions as you'd like during the card's valid period. If you only have time for one or two attractions, check out what Get Your Guide has to offer. You can book your tickets online in advance so that you don't waste time standing in line, and sometimes pay less than the walk-up price. In addition to half price tickets for shows, comedy clubs, and other performing arts, Goldstar frequently offers tickets for Boston Harbor dinner cruises, and special performances by famous visiting performers such as Cirque du Soleil. You'll sometimes even see Boston Celtics tickets on offer.